A history of being uninsured can cost you when you decide to purchase a policy. Learn how to save. Obtaining a car insurance quote if you haven't previously had an auto insurance policy is possible — but your rates might be more expensive than average. 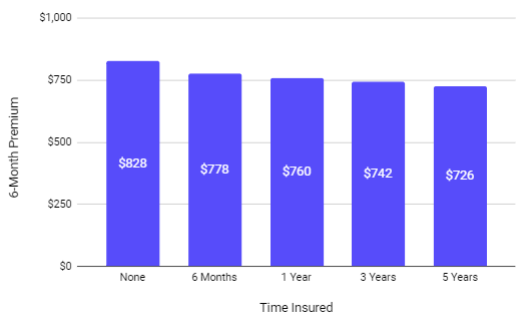 The typical difference in premium between an auto insurance policy for a previously uninsured driver and a currently-insured driver is 6%, or $51, per six-month policy period. We tracked down the cheapest providers for a previously uninsured driver: USAA and State Farm (methodology). We'll review detailed rate information and ways to save below. Why is insurance history a rating factor? USAA and State Farm offer the most affordable rates for a previously uninsured 30-year-old male. For those who qualify, USAA’s average premium is an affordable $532 for a six-month policy. If you’re not a military member or related to one, State Farm's policies cost $132 more than USAA's — $664 per policy period. Although you'll pay more up front due to your lack of insurance history, your rates should decrease every six months as long as you avoid a lapse in coverage. The difference in premiums between a driver no insurance history and three years of prior insurance coverage is $86 per six-month period. This data is based on an average composite profile. The best way to see how much a specific company will charge you is to fetch a quote. Enter your ZIP code below to compare quotes from popular auto insurance companies. Why is insurance history used as a rating factor? A few rating factors are used to calculate car insurance rates, some of which aren't tied directly to a driver's history of tickets or accidents. Credit score, age, homeownership, and insurance history are not tied directly to driving history. Car insurance companies see these characteristics as reliable predictors of risk. In the eyes of an insurer, a driver who has been licensed without insurance may have been driving uninsured — a potential signifier of risk. Similar to a bad credit score or poor driving history, a lacking insurance history may lead to more expensive insurance premiums. There’s not much you can do to change your insurance history. However, there are ways to lower the cost of your insurance policy. Let’s break down some cost-cutting solutions. There are a few reasons this will be the best way to save on auto insurance. As soon as you have been insured for six months, you should expect your premium to decrease. 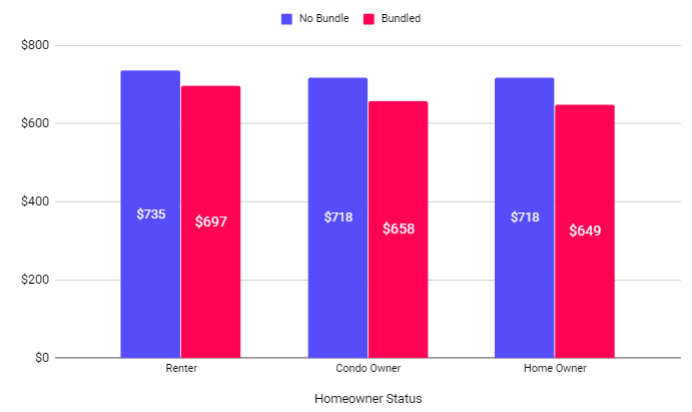 But your current provider might not lower your rate by as much as another provider would. Considerable variance exists between insurance companies' premiums. Compare car insurance options carefully to find the one best-suited for your price and coverage needs. Enter your ZIP code below to compare rates based on your driving profile. In order to earn a multi-policy discount, bundle any insurance policy you have with your auto policy (or vice-versa). A multi-policy discount will allow you to save on your home or renters policy, in addition to your auto insurance. Below are average savings drivers earned by bundling policies in 2018. If you don't have a renters or home insurance policy, consider acquiring one. They're relatively inexpensive and offer protection for your assets in the event of a major loss, or if you are found legally responsible for damages that occur on your property. Vehicles depreciate rapidly. If you own a vehicle worth less than $4,000, you might not need collision and comprehensive coverage. These coverage options are designed to protect your vehicle from property damage. However, if your vehicle isn’t worth much, you might be paying for coverage you do not need. Use Kelley Blue Book and NADA online as resources to determine the value of your vehicle. If you determine you still need comprehensive and collision, consider raising your deductible. By raising your deductible, you can lower your premium. Unless you have accident forgiveness, every car insurance company will raise your rates after you file a claim. In 2018, the average rate increase for an at-fault accident was $303 every 6-months. Most insurance companies will keep this $303 surcharge on your premium for 3 years. This will cause the overall rate increase for one at-fault accident to equal over $2100 in additional premium. If you’re involved in a collision-type accident, follow our steps to see if it is cheaper to pay out-of-pocket. Get an estimate of the damage prior to speaking with your insurance company. This is what you would pay out of pocket. Consult our State of Insurance to see how much at-fault accidents increased rates in your state. Multiple the rate of increase by three (for the years during which you will be charged). Add this to your deductible. Compare the costs and choose the least expensive option. Telematics embodies an insurance premium based on your actual driving habits. While some non-driving attributes are still utilized, such as your age and credit history, it’s much more reflective of how you drive. Below are some average savings you could expect from popular providers in the US. For more information, see here. Although discounts can be helpful for lowering your premium, they will not drastically lower your rate. You should not stay with your company simply because they offer you a discount. Make sure you consider the overall rate. However, these discounts can be helpful. A non-owners car insurance policy only provides liability coverage for drivers who do not own a car but want to maintain their insurance coverage. If you’re going to sell your vehicle, you should consider buying a non-owners policy. Because they offer no collision or comprehensive coverage, they tend to be fairly affordable. This will not only keep you continuously insured but offer you additional liability insurance when you’re driving. Bottom line: the best way to find cheap car insurance while uninsured is to shop around. Enter your ZIP code below to get started. If you’re not ready to shop and would like to learn more about auto insurance, see below. Should you file a claim after a car accident?